COMEDY. Adapted from award-winning author Luis Sepúlveda’s novel The Story of a Seagull and the Cat Who Taught Her to Fly. Zorbo the tomcat, used to living “the cat’s life” with his buddies Sal, Einstein, and the Admiral on Boston harbor, never planned to settle down. Yet when a seagull is downed in an oil slick and deposits her egg on Zorbo’s porch, what can a guy do? Promise to hatch it and raise the gull! Zorbo’s pals help him “sit on” the egg, so that when the baby gull they name Lucky arrives, she insists on calling Zorbo “Mama.” The challenges of finding Lucky food, protecting her from bad rats like Sneaky and hungry cats like Trash-heap, and learning to love Lucky change all the tomcats’ lives. Even Zorbo’s dates with his beloved Lucinda have to take a back seat when it comes time to teach Lucky the skill of flying. Will the Flying School be a flop? Will other gulls give Lucky the right advice? 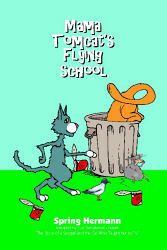 And will Lucky's dear Mama Tomcat be able to help her take wing and soar? This tale of growing up in a very special family will delight children of all ages. Perfect for touring. Winner, Central Washington University New Plays for Youth Project, 2008. Semi-finalist, Bonderman Youth Playwriting Symposium, 2007. Spring Hermann is the author of several plays and works of fiction and non-fiction. She studied theater design and dramatic literature at the University of Iowa and Indiana University. Ms. Hermann has worked in public relations and marketing and has taught college theatre courses. An Illinois native, she resides in Connecticut.